What Is The Best Slow Cooker for Truck Drivers? Cooking a healthy, tasty meal out on the road can seem like a difficult task..but it doesn't have to be! If you can find the best slow cooker for truck drivers, you'll be well on your way to some good eatin' in no time. We've talked with thousands of truck drivers and our friends over at TheHealthyTrucker.net to come up with a list of 3 things to look for when searching to find the best slow cooker for truckers. So, get ready to learn the key things you need to know to get your first slow cooker meal going right away. Convenience - If any truck driver is realistically going to use a slow cooker, it must be one that plugs into a lighter/power socket. 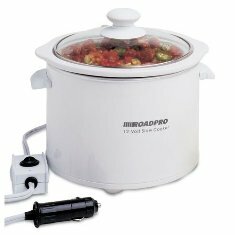 The RoadPro RPSL-350 12V 1.5 Quart Slow Cooker is a top pick for many truck drivers out there. It has a cooker base with easy grip handles along with a glass lid which includes a stretch cord to keep it secure. All of this makes cooking out on the road easier and more convenient. Performance - Of course, truck drivers need something that's not only convenient but can actually cook the food (this can be a problem with many portable crock pots/slow cookers). Truckers need something they can prepare before starting their route and have a nice home-cooked style meal at the end when they finish. "I really enjoy this small portable crockpot! Instead of stopping at fast food joints while traveling, at least once, we can stop at a lovely reststop, pull out the plates, and enjoy whatever good thing has been tantilizing us while we drive! My only complaint is that the three little legs on the bottom all it to tilt a bit, spilling some juice out even with the elastic band on it. Being a problem solver, I've worked out something, but if I was to buy another, I'd look for one with four posts on the bottom, not three." Affordability - Everyone, not just truck drivers, needs something that's not going to break the bank. So the best slow cooker out there for truckers MUST be affordable. At right around $30, again this RoadPro Slow Cooker fits the bill. $30, I mean heck, that's just a couple meals...and think of the money you can save by cooking in your truck vs. eating out. While the slow cooker mentioned in this post does generally work well, there have been some cases of the slow cooker going out after several months/years. Should this happen, at least you won't be out hundreds of dollars and can replace the slow cooker at the price of just a couple meals (assuming it's outside of warranty). "My husband is an OTR truck driver and this little crock pot is a joy to have. Saves LOTS of money over the course of a year with him cooking in his truck. He has used it almost every day over the last 6 months and the heating element finally died.So I ordered another one for him.. 30$ for the crockpot compared to 16$ a night at a truck stop restaurant Its worth the investment. Plus if he gets delayed at a pick up or delivery he doesn't care cause dinner is only a few feet away. The only complaint he has is that on long days it is torture smelling dinner cooking as he drives. =)"
When you take a look at these three key factors and consider the slow cooker reviews from truck drivers out there. The trusted name of RoadPro seems to get the job done. If you'd like an affordable, convenient slow cooker that performs for truck drivers, give the RoadPro RPSL-350 12V 1.5 Quart Slow Cooker a try. 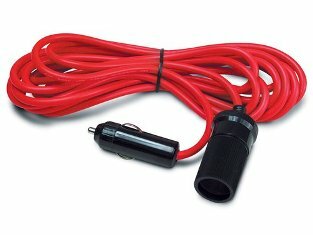 PRO TIP: Pick up the RoadPro RP-203EC 12V 12' Extension Cord with Cigarette Lighter Plug to make cooking on the road even more convenient. At under $10, you'll be glad you did. RELATED POST: See What Is The Best Bluetooth for Truck Drivers? Truck Drivers - We would love to have your recommendation for the best slowcooker in the industry, so take a moment to leave a comment and let us know.